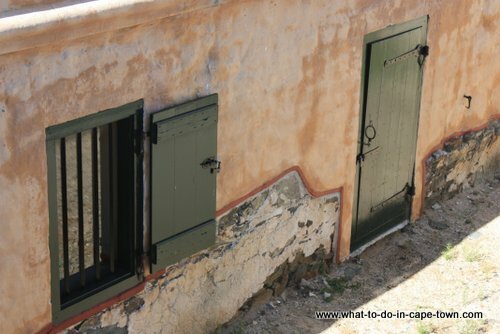 The Chavonnes Battery Museum celebrates the life, death and re-birth of Cape Town’s 2'nd oldest major fortification. When completed in 1726 the Battery was a massive fortification, whose stone-faced wall reared up from the water’s edge. 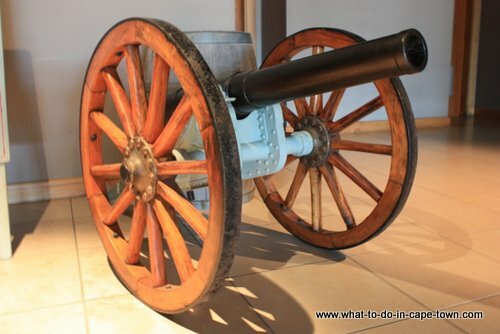 Sixteen great guns were mounted which between them had an arc of fire of nearly 180 degrees. When the construction of the Alfred Basin began, part of it was totally demolished with the stone being re-used in constructing the new docks. The rest vanished beneath warehouses and later a fish-processing factory. The Chavonnes Battery became a legend remembered by only a handful of Capetonians, doomed to remain hidden forever. In 1999 the Board of Executors obtained the site and had the battery scientifically excavated by archaeologists of the University of Cape Town. 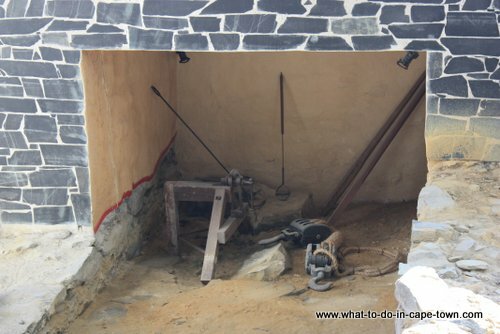 Then it created a magnificent museum in the basement, thereby preserving this important but almost forgotten piece of early Cape history for generations yet to come. The museum’s layout is an unusual one, since part of it is in the open air, although the greater portion is indoors. The open-air section consists of the extreme left-hand portion of the seaward-facing front wall, which has been built up to its authentic original appearance, including two underground rooms. Three great cannon on reconstructed garrison carriages. In the indoor section graphic information boards tell the story of the battery in all its phases of existence. Other boards tell the story in words and pictures of the indigenous clans the Dutch East India Company’s men found here, and provide information about some of the other Cape fortifications which followed the battery. Two very detailed models depict the battery as it looked when completed in 1726, and a bird’s-eye view of Cape Town and Table Bay about 70 years later. 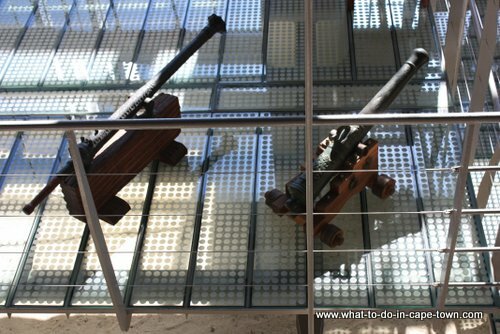 One of the most popular sections is the gunnery display, a mixture of genuine artifacts, careful replicas and some of the best models to be found anywhere in South Africa. 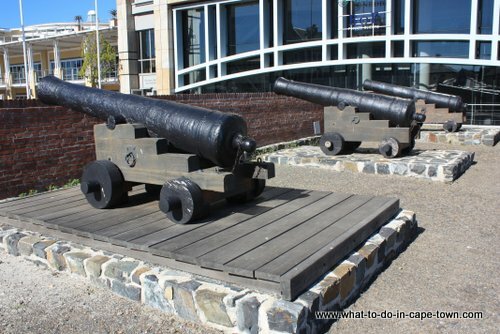 Let a registered tour guide walk you through the history of the V&A Waterfront, sharing fun facts and anecdotes. 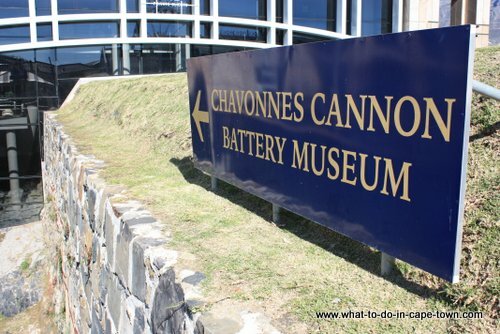 The tour starts at the Chavonnes Battery Museum and lasts approximately an hour where up to 22 landmarks can be visited. This a popular walk, so rather book to avoid disappointment. Location: In the V&A Waterfront at the mountain end of the clock tower square. Return from Chavonnes Battery Museum page to Homepage.